The $38 million arts and affordable housing project slated to replace (and incorporate) the East Precinct parking lot on 12th just north of Pine is moving into the reality phase. 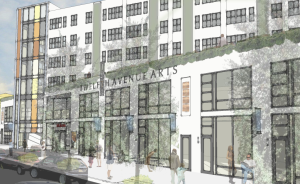 An Early Design Guidance session with the Capitol Hill Design Review Board for the 12th Ave Arts project has been scheduled for October — and CHS finds Capitol Hill Housing and the city are already searching for an arts organization to manage the space. The project has been kicking around Capitol Hill’s “to do” list for more than a decade as concerns about providing East Precinct with adequate parking were part of a long list of factors delaying the effort from moving forward. We wrote about the project’s details back in January. This summer, the process pipes unclogged thanks in no small part to a better cost environment for developers following the long economic downturn. In June, dignitaries gathered with representatives from CHH to announce the agreement that paves the way for the new development and arts center. There are also plans to provide community meeting and office space in the development that could eventually be home to organizations like community councils and the Capitol Hill Chamber of Commerce. The development includes the creation of two performance spaces; a proposed 149-seat raked theater with fixed sets, and an 80-seat flexible black box space. In August, Seattle Central announced that the Balagan Theater group would take over management of its Erickson Theatre space. I hope there will be funding for continuing operations in the future. This city is great at building edifices, but not so good at providing funding for programming. Great project! Now can we get some great architecture please?! The rendering looks pretty boring for such a creative & hybrid program.